The nice thing, though, about living on Colorado’s western slope is the opportunity to fly directly over the Rockies whenever flying through the Denver hub. 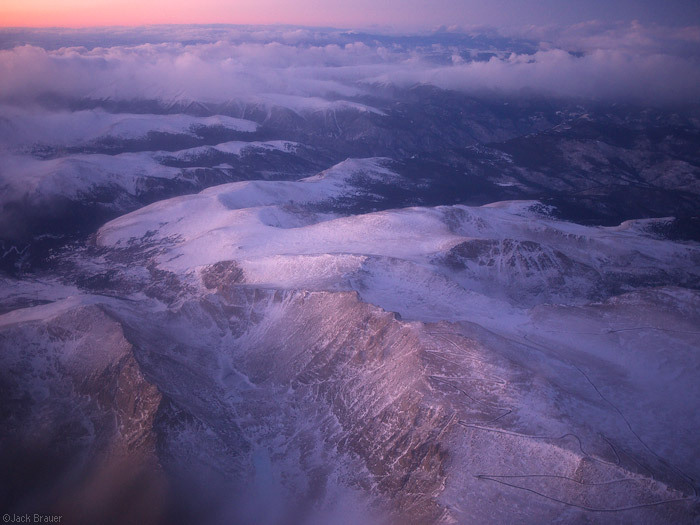 The half-hour flight yesterday from Denver to Montrose was one of the more scenic ones I’ve done, since we went right after the sun set, right after a snowstorm cleared. I was snapping away at the window with my camera most of the time, happy to have a nice consolation flight after such a long two sleepless days. See more shots below! I shot these with a wide open f/1.8 aperture in order to make sure that the little streams of de-icer fluid streaming across the window would be out-of-focus beyond recognition. ISO 400 ensured a quick enough shutter speed to prevent motion blur. 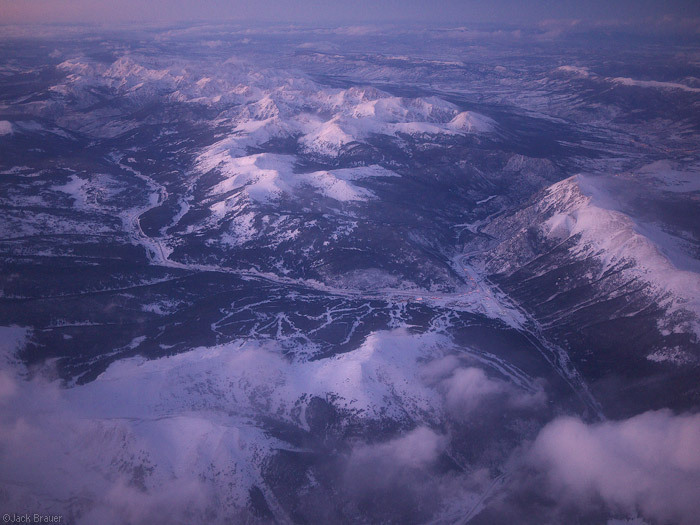 Aerial view of the Continental Divide in winter. Landslide Peak (13,238 ft) is at the bottom. Grays Peak (14278 ft / 4352 m) is poking out of the clouds at the top center of the photo - January. It’s always fun to pick out the various peaks and basins from the air, many of them places I’ve hiked, camped, and/or snowboarded before. Aerial view of the ski resort and town of Copper Mountain. The Gore Range is at the top - January. Here’s I-70 winding past Copper Mountain and through the Gore and Ten Mile Ranges. Glad I’m not driving down there! 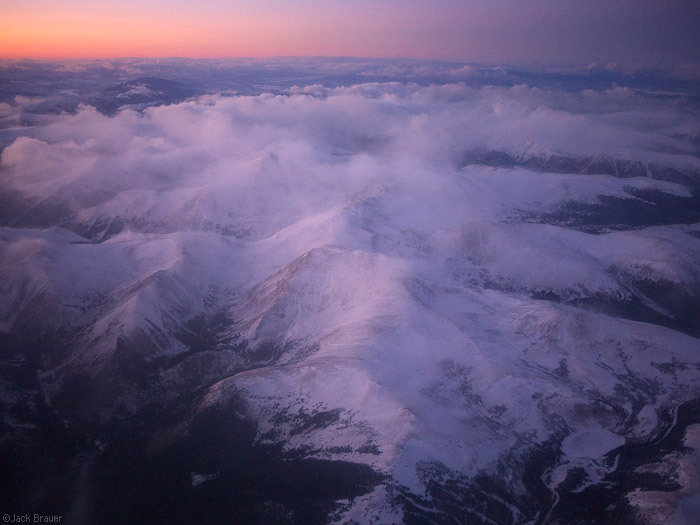 Aerial view of the Elk Mountains near Aspen - January 2012. 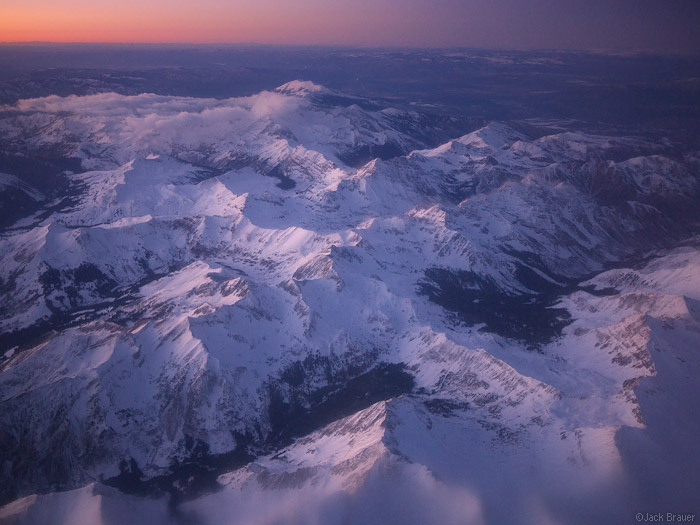 Flying directly over the rugged Elk Mountains is always a highlight of the flight. In my experience the north side of the plane is usually the best side for viewing the Elks on this flight. The Black Canyon is the other highlight, but that was on the other side of the plane this time. It’s a bit harder to predict which side of the plane to be on to see the canyon, probably due to the close proximity of landing in Montrose. 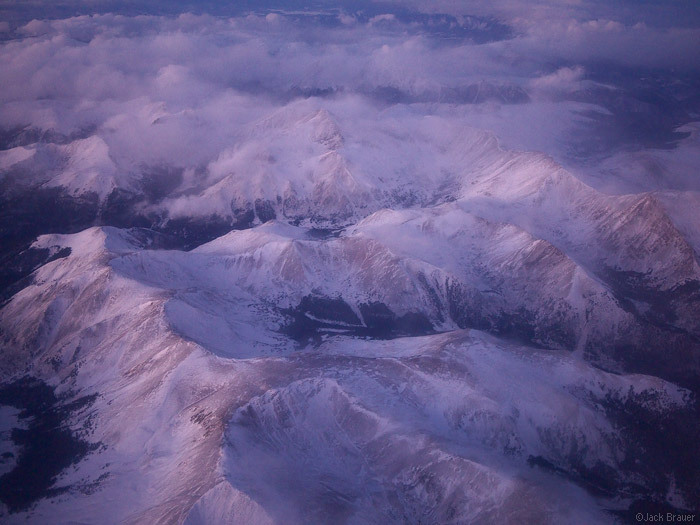 Aerial view of the Elk Mountains near Aspen - January. The Maroon Bells are visible in the upper center of the photo. I’m glad to be back home! Welcome home, Jack! And nice shots. You picked a great day and time to fly. Thanks Mike! Hope all is well in SD! Welcome home, Jack. 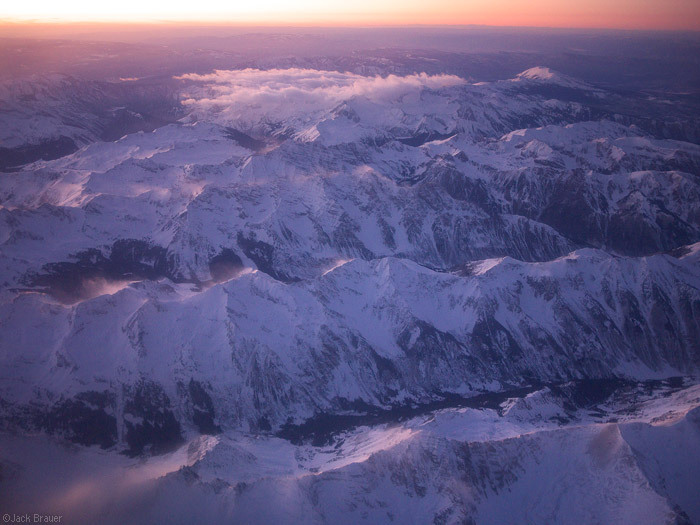 Love these shots…you really see the lack of snowpack in a lot of them. Hopefully your return home will signal a return of snow! Welcome home! 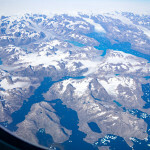 There is no better view than a window seat on an airplane! Thanks Chris! I always try to reserve window seats where there’s not a wing!